Spring time is here and that means so are Passover and Easter. The two holidays are intertwined and have much to do with food and gardening. In spring, the popular bulb to grow in the landscape are the amaryllis. They are carefree and multiply readily. Below is a nice article and slide show featuring these lovely flowers. During the Passover Seder we eat charoses, which is made out of chopped walnuts, apples and wine, which represents mortar Jewish slaves used to build the pyramids. The bitter herbs (horseradish) represented the hard times of enslavement. If you ever saw Charelton Heston in the Ten Commandments that is the story of Passover that we tell the first and second nights of the Seder meal. When the Jewish people were finally freed, they had to leave early morning, before their bread had risen, rushing off into the desert for forty years. Hence we do without leavened bread and eat Matzah for the week of Passover. During Easter, lilies, tulips, hyacinths are utilized to show a new beginning. Palms are used to make crosses. As the people of the Jewish faith do without bread for Passover, the Catholics due without something of their choice for lent. The communion cracker is similar to Matzah. Every Friday from Ash Wednesday until Easter, during lent, no meat is eaten on Fridays. I wish you a wonderful spring and holiday season. Thank you for stopping by my blog and see you again soon! On Saturday morning, March 23, tune in to #rosechat radio and learn about the healing power of roses. As a horticulture therapist, roses play an important role in my healing engaging activities. Currently I work with seniors and roses play an important role in their memories. What did the flower girl drop on the floor on their wedding day? Rose petals. What flowers did they get from their husbands for special occasions? Roses. What parade did they watch every New Years Day? The rose parade. What was one of their favorite flowers to grow in their gardens? Roses. My residents love to hold a rose and the first thing they do is hold the flower to their nose. I only grow the most fragrant roses. As we age our senses diminish. Some seniors I work with have lost their sense of smell totally. Over the years I have installed several rose gardens at nursing homes, independent senior living facilities and assisted living apartments, senior activity centers, day programs, and Alzheimer units. The thorns can become a health hazard to those on blood thinners, diabetics, and the frail elderly. Be careful where you plant them. I like them to be close enough to have access but not in the way so they get scratched as they walk or wheel themselves by the bushes. All the above roses are photos from my backyard garden. I love growing roses and always have bud vases in the kitchen and bathrooms with roses in them. The link below is for the rose radio broadcast. You can catch it live or listen at your leisure at any time after the broadcast. Click on the link below to listen. 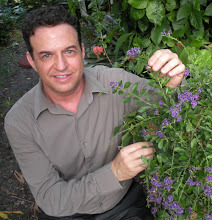 Rose chat radio guest Robert Bornstein explains the healing powers of the rose. Thank you for stopping by my blog and see you again soon. One of my favorite aspects of gardening is observing blooms opening day by day. I like to take a few minutes before work to tour the garden. This week the ginger is starting to bloom. It is beautiful to see sunlight shining through the tropical foliage and highlighting the bloom as it begins to open. As the sheath separates, the smooth white flowers with pink tips reveal themselves like pearls. As the cluster matures, each flower opens up and within the heart of the white flower, revealing a yellow/orange center. It is reminiscent of a snap dragon. Each day more yellow flowers emerge from the top of the cluster downward. The joys of gardening are plentiful. Thank you for following my blog and see you again soon!